Taking a vacation with your dog can be a great bonding experience for the both of you. Plans can get a little gritty though if where you’re going isn’t dog-friendly. If you’re planning a trip to the Northeast, this Pennsylvania dog-friendly travel guide is just what you need. If you like history and the beauty of nature, then you and your pup will love visiting Gettysburg National Military Park. Here, there are hundreds of acres for you to explore with your dog. Battlefields, cliffs faces, parks, and outdoor museums all welcome two-legged and four-legged friends. In Devil’s Den, an infamous Gettysburg battle ground, you and your dog can climb rocks, hike through the woods, and learn about the war-torn history of the land. Be sure, however, to always keep your dog on a leash and pick up after him. Then everyone can enjoy the park. Many Pennsylvanian natives remember spending summer vacations at Knoebels Amusement Park – but did you know the entire park is dog-friendly? The park, and many of its rides, allow you to bring your dog. All campgrounds and the park areas allow dogs on the premises, and many of the surrounding lodgings are dog-friendly as well. Before you travel to Knoebels, however, be sure to ask what ride limitations there are for dogs and if there are any lodging limitations such as weight or breed. Presque Isle State Park is a beautiful place where you can explore all the wonders of Lake Erie and the surrounding woods. There are plenty of places to camp or stay with your pup in the town. While in Presque Isle you can hike, fish, camp, and swim among other fun activities. While at Presque Isle, make sure to clean up after your furry friend and keep him on a leash where necessary. Possibly the most pet-friendly, La Quinta offers pet beds, piddle pads, and water bowls as well as tennis balls and other toys. La Quinta has these pet amenities without an additional charge – unless there are more than two dogs or cats. They also do not have weight or breed restrictions. 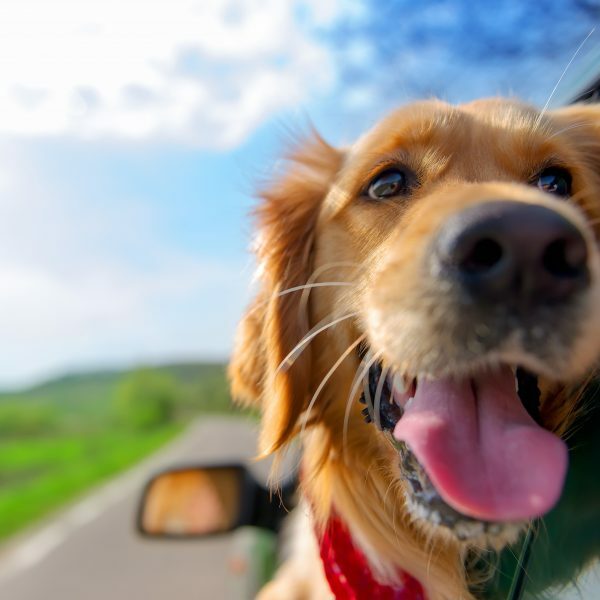 If you are going on a cross-country trip, your best option will be La Quinta for you and your pooch. Best Western has over 1,600 hotels that are pet-friendly. This chain will allow two pets to stay as long as they are under 80 pounds each. They will even offer more exotic animals such as birds, monkeys, and reptiles. They will, however, charge for a pet staying with you. This is usually a minimum of $20 a night. Be sure to check with the chain before booking the room. The Red Roof Inn has 360 properties to accommodate to you and your pooch. They will not charge additional costs for having a pet, but do not have a doggie concierge or complimentary pet beds. However, they will always be happy to leave the doggie door open for you. Sonic Drive-In can be a great place to stop for something to munch on and play a game of fetch. When you use the drive-through, you can ask for a few doggie biscuits for your pup. If you stop and stay a while, they welcome you to walk your pup around the property to stretch their legs and get some energy out. They only ask that they stayed leashed at all times and you clean up after your furry friend. This burger joint welcomes dogs with open arms and even offers a doggie menu! There’s no doubt about them being dog-friendly and they even say, “We were born in a park after all!” to show they are happy to welcome bipedal individuals and their four-legged friends. The Shake Shack menu consists of tasty treats such as a “Bag O’ Bones” and “Pooch-ini.” So grab your leash and your appetite – you both won’t leave hungry! The outdoor sections of certain Olive Garden restaurants will allow dogs as long as they are on leashes. Before heading over, call ahead just in case. Make sure to ask if they allow dogs, and find out if there are any limitations. While some servers may offer your dog a breadstick, they do not have a specific dog menu or any perks for your furry friend. So be sure to bring some kibble and a leash. If the Applebee’s has a patio section, then they likely allow dogs on the patio. Be sure to ask before reserving a table, and have your dog leashed at all times while in the restaurant. At an Applebee’s in Richmond, Virginia they even have “Yappy Hour.” There you can bring your pup, have some apps, and enjoy the afternoon with man’s best friend. Vacationing with your dog can be a lot of fun for you both. You’ll be thrilled to have such an eager travel companion, and they will be tickled to spend a few days with you. With a bit of planning, and patience, you will wonder why you didn’t start vacationing with your dog sooner! For dog-friendly travel in other states, take a look at all the dog-friendly travel guides.